A110-2 UNLGTD TOWER 250 FT AGL .17 MILES ESE AER 04. A110-4 WINDSOCK LGTS OTS INDEFLY. A110-5 WILDLIFE ON & INVOF OF RY AND TWY. A17 FOR SVC AFT HRS CALL 870-450-7599 FEE CHARGED. A57-04 APCH RATIO 23:1 TO DSPLCD THLD. A57-22 APCH SLOPE 46:1 TO DSPLD THLD. 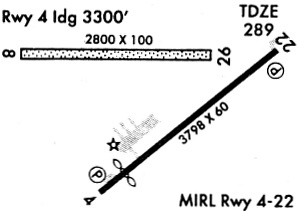 A58-04 ROAD 180 FT & EXTENDS INTO RY PROTECTION ZONE. A58-22 OPEN DITCH 55 FT WIDE; 10 FT DEEP 138 FT FM THLD CROSSING. A81-APT ACTVT MIRL RY 04/22, REIL & PAPI RYS 04 & 22 - CTAF.